It’s his name that went into the history books for skating in 1,000 NHL games, but Eric Brewer will tell you reaching the milestone was very much a team effort. He pauses for a brief moment, not in reflection, but more so in wanting to afford his biggest supporters the recognition he feels they rightly deserve. 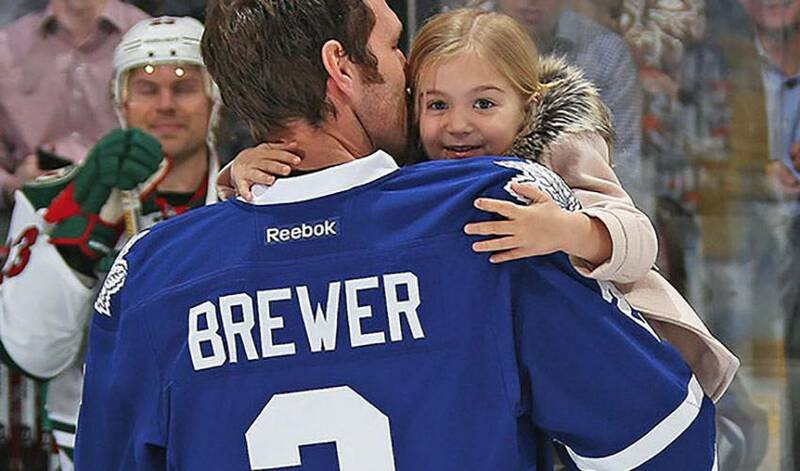 On March 23, in a ceremony at the Air Canada Centre, the Toronto Maple Leafs and the League honoured Brewer with gifts and a video tribute for succeeding in hitting the 1,000-games mark. Joined by his wife, Rebecca, the couple’s two daughters, and his parents, the veteran defenceman also had plenty of familiar faces in the stands that evening, as well as on March 21 in Ottawa, the night he became the 300th player to reach 1,000 games. His personal cheering section included members of the Aubichon clan, the billet family Brewer lived with during his Western Hockey League years with the Prince George Cougars. Brewer reserved some of his most heartfelt words for his wife. Lucky is also a term he applies to his numerous successes playing for Team Canada. Brewer has gold medals from the Olympics (2002), World Championships (2003, '04 and '07) and World Cup of Hockey (2004). Win or lose, Brewer found it early on that he could always count on his loyal and long-term support base.